One of the most compelling things about photography is the story behind each photo. Sometimes it’s the story of how the image was captured. Other times it’s the story of the person, place, event or thing in the photo. Whatever the case, it’s as much about stories as it is getting “the shot”. I’ve been lucky to get over to Smith Island in the heart of mainstem Chesapeake Bay to do a little paddling and try to grab some photos that capture the flavor of this uniquely Chesapeake place. 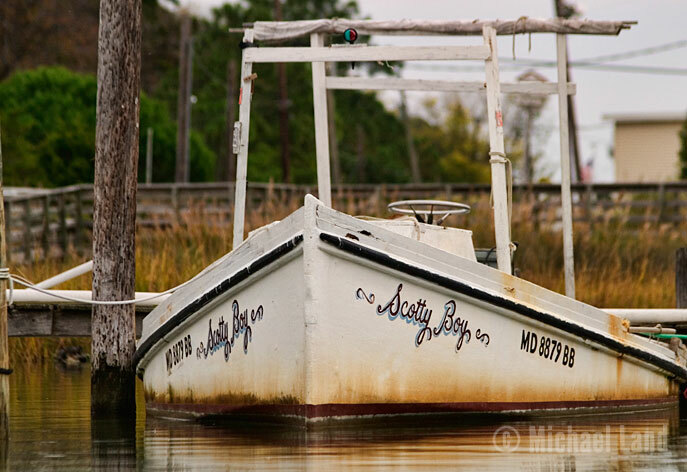 One photo I got was of an old crab scraping workboat called “Scotty Boy” docked in Ewell on Smith Island. This particular boat drew my attention because you could just get a sense of the hours upon hours that this boat has been used to harvest crabs on the Chesapeake. Recently, I met with fellow Bay photographer Dave Harp, who frequents Smith Island. He produced a fantastic little video about David Laird - longtime Smith Island waterman and the owner of Scotty Boy - that really gives you a sense of place and tells his story.